Pro-Russian militants violated the ceasefire in Donbas on 23 occasions. Despite the agreed ceasefire from 1 April, pro-Russian militants carried out 23 shooting attacks in the antiterrorist operation (ATO) area in Donbas from midnight to 6 p.m. Kyiv time on 3 April. Two Ukrainian troops were killed and two wounded, the ATO HQ said in its evening update on Facebook. The enemy was most active in the Donetsk sector. 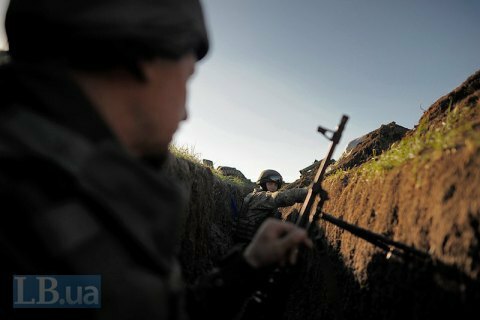 It used 120-mm and 82-mm mortars against the ATO positions near Avdiyivka and the Butivka mine. Militants used grenade launchers and small arms near Pisky, Verkhnyotoretske, Yuzhne (Pivdenne) and Avdiyivka. Kamyanka was targeted with heavy machine guns and Zaytseve with small arms. The hotspots in the Mariupol sector included Shyrokyne, Chermalyk and Krasnohorivka where militants used heavy machine guns. They targeted the ATO strongpoints near Vodyane and Bohdanivka with small arms. An enemy sniper was active near Hnutove. In the Luhansk sector, the militants fired with 120-mm mortars on the Ukrainian positions near Krymske. "In some cases, to suppress enemy fire, the ATO forces opened fire," the ATO HQ said. Last week the Minsk group on a Donbas settlement agreed on the Easter ceasefire from 1 April.